George Clooney and Amal Alamuddin did it. 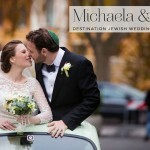 And so did today’s super cool couple, Yael & Micha! 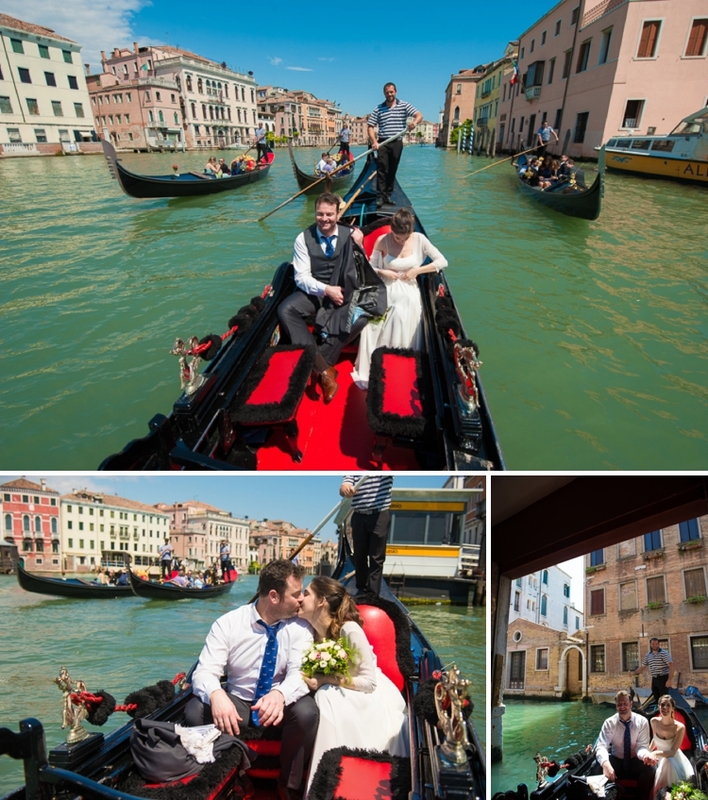 Yes, Venice was the chosen setting for today’s Tel Aviv-based bride and groom, and in true Venetian style all the wedding guests together with the bride and groom, rode the gondolas of Venice for an incredible and intimate Jewish wedding (only 15 people). The whole affair was planned in just TWO WEEKS (surely that’s some kind of destination wedding record?!) thanks to the the wonderful Amber from Angel Lion Wedding & Events. Smashing The Glass is all about making your day, your way so I love the essence of this wedding. 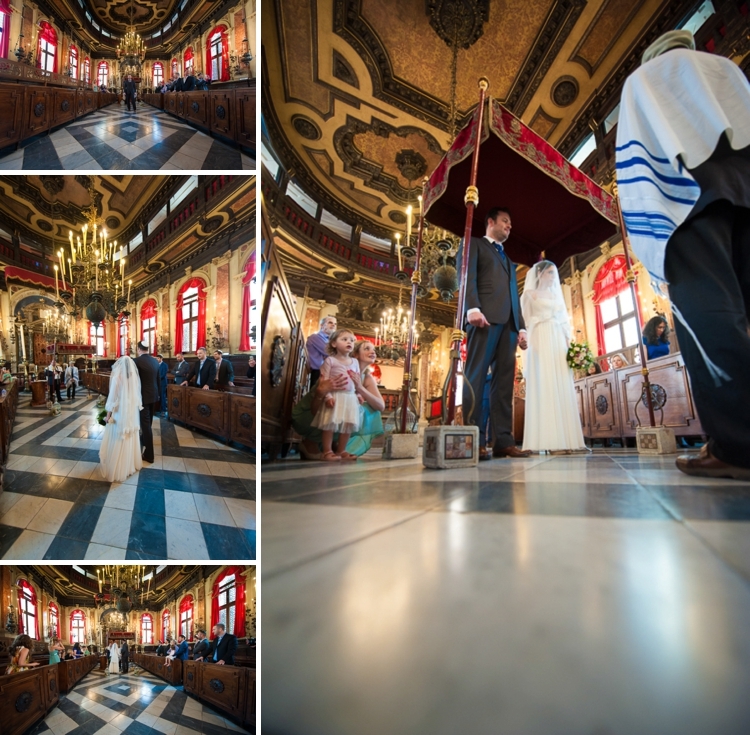 EVERYTHING reflects the bride and groom, and if you take a moment to read through Yael’s report, you’ll see why. 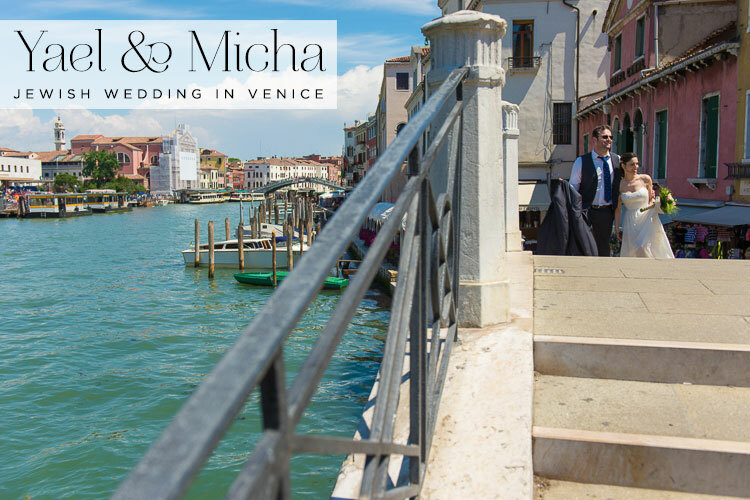 Oh.. and for some fun, look out for the stories about Micha’s suit, and the ‘sporty’ finish to their wedding! Yael also hands out some really useful tips and a generous helping of advice at the end. 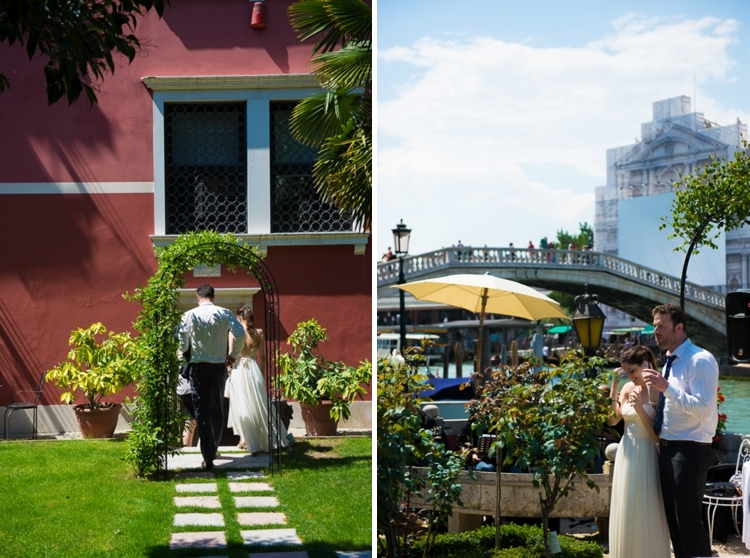 Swoon over the perfectly captured images by Mauro Pozzer and dream of being in the Venetian sunshine. Happy Tuesday everyone! We wanted a small intimate romantic wedding (with just 15 guests) and very much wanted to spend quality time with close family and friends. 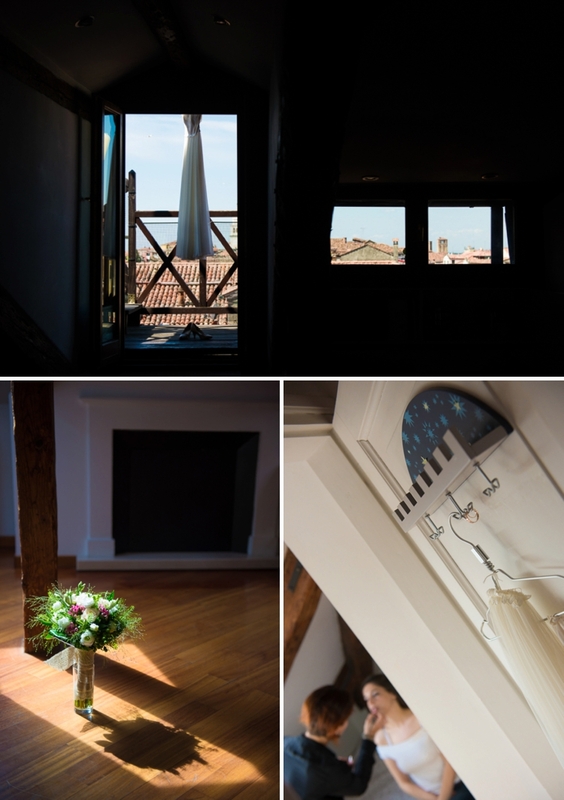 Venice and Ca’ Nigra (the venue) seemed ideal for this. 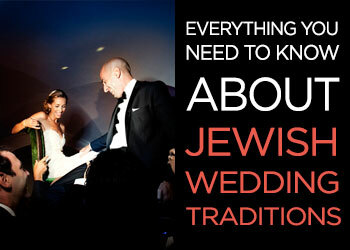 Had we had our wedding back home in Israel it would have had to be a much larger, and less intimate, affair. 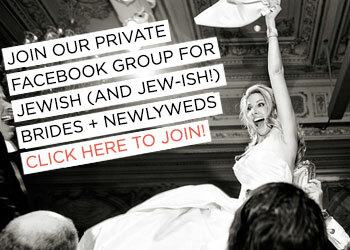 Being from Israel it’s not entirely acceptable to get married abroad and most couples who do, go or to Cyprus to have a civil wedding (and ditch the religious Jewish wedding) – Not many people in Israel know that you can have a Jewish wedding in Venice and no one would know how to go about the procedure, which is actually pretty simple! 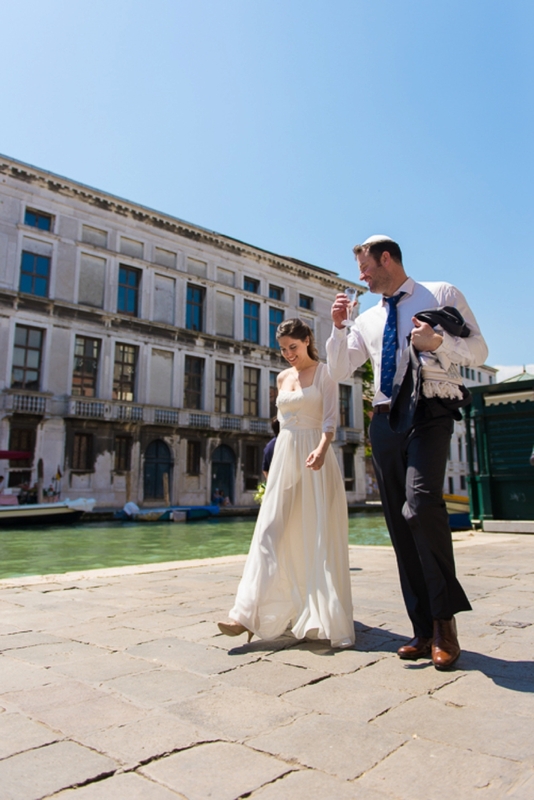 My husband is an avid reader of Daniel Silva’s spy novels featuring an Israeli spy and his Venetian girl friend/wife Chiara so my husband had a thing for Venice because of the books he read! 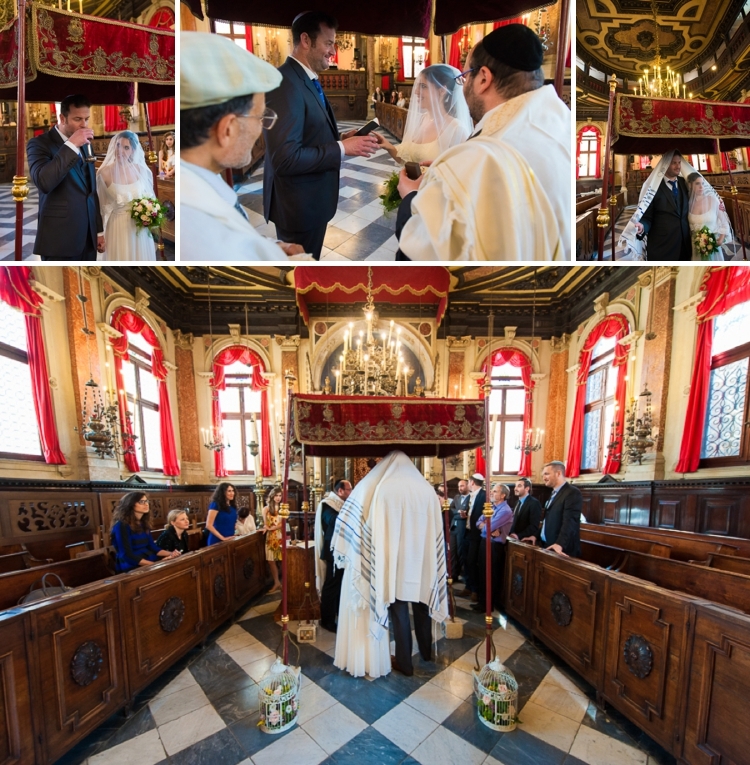 In hindsight, It was such a unique experience to have the mikveh and ceremony in Venice, such a special, beautiful and romantic city! 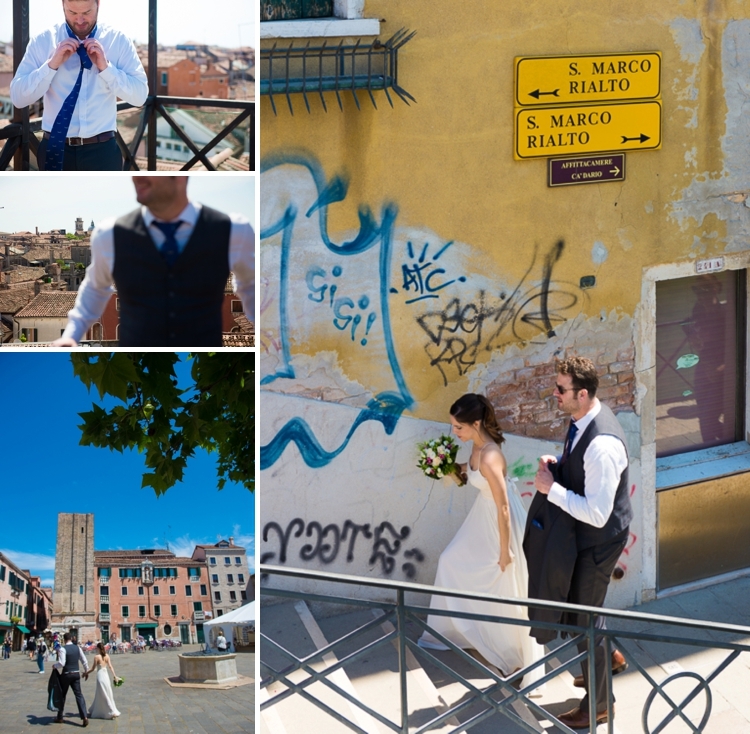 Overall, it was one of the best weekends I’ve ever had, having my best friends and family enjoying our wedding altogether in Italy. Organising the wedding in just two weeks! 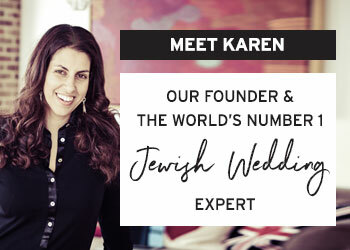 We had a wedding planner, Amber Rist Mollison, from Angel Lion Wedding & Events, who was super helpful having been put in a position to organise a Jewish wedding in just two weeks! 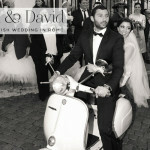 We chose not to have a theme or colour scheme but we did include a few personal touches, such as mask, gifts for the guests, and a surprise gondola ride for everyone from the synagogue to the reception venue. As our wedding was a small intimate one we prepared the invitation ourselves and sent it by email to our guests. The invitation was a kind of a ‘weekend agenda’ of things to do before and after the wedding: restaurants, bars, cafe’s, parties, parks etc. The invite was supposed to ignite a little holiday spark amongst the guests. Whilst I was still in Israel, Amber asked me to describe how I wanted my hair and makeup, so she could find me the right make up artist in Venice. I emailed her a few pictures of images I liked and she straight away knew to to connect me to Letizia Cordella who was perfect! My dress was designed by the amazing designer Anat Manos. When I was searching for my dress I still wasn’t sure what kind of wedding we would be having, but it was important to to have a dress that would be delicate, yet bohemian and fairytale-like. When I tried on the dress for the first time, I liked how it was sweet and princess-like. I especially loved the contrast between the emblazoned tight fitted corset and the loose silk skirt. But most of all I liked the open back. Micha of course left his suit to the very last minute, and he literally purchased a suit four days before the flight, from the nearest shop near out house in Tel Aviv! He tried on three suits and picked a perfect navy blue one. 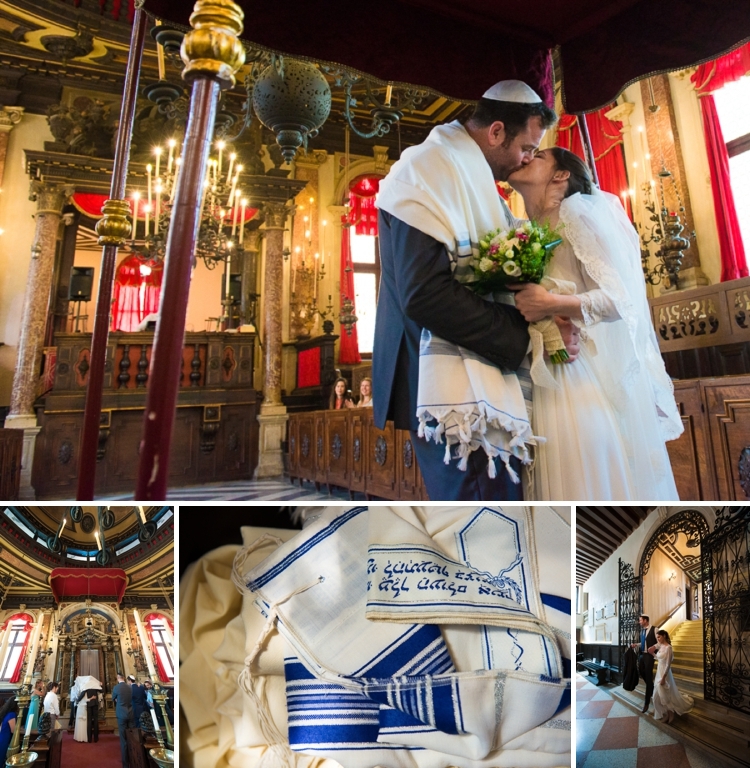 One day before we left Israel he got cold feet and went and bought a different suit, by himself, which he would not show me until the big day 🙂 To seal the deal, he picked a perfect (albeit kitsch!) tie in Venice, which had cute little gondolas decorated on it! I wore a small delicate golden hair clip which belonged to mum when she was younger. I was so moved when I walked up the aisle accompanied by my siblings, waiting for Micha to walk me to the chuppah. That moment absolutely took my breath away. 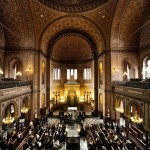 The synagogue prescribed it’s own custom chuppah which is a couple of hundred years old. 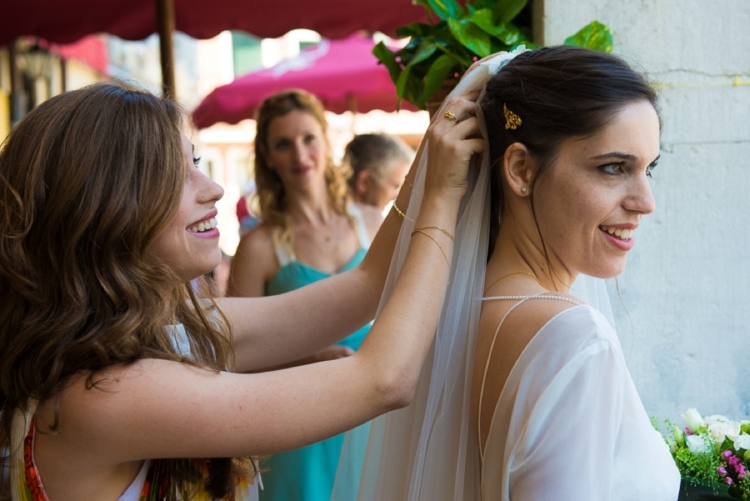 We both liked the idea that the chuppah had seen many weddings before ours. Before the chuppah we had several kitsch songs from the Forest Gump sound track because its my husband’s favourite movie — it makes him really emotional! As we walked down the aisle the beautiful Gladiator song Now We are Free played. 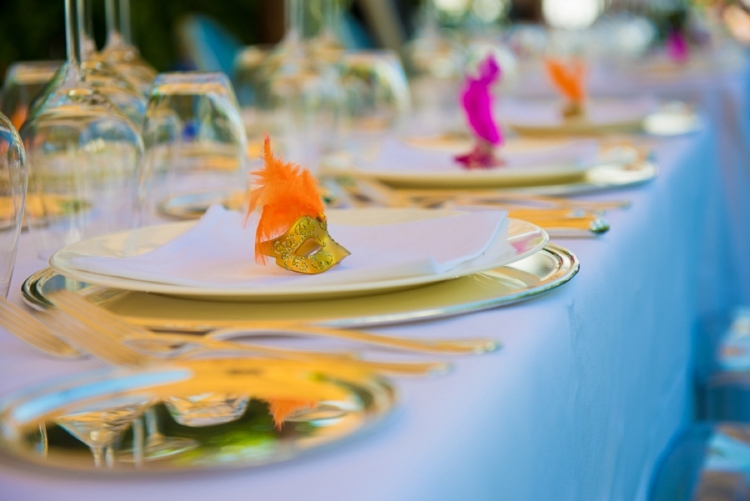 I only really cared to have lots of colours and yellow flowers during the event with a bright sunny feel to it. 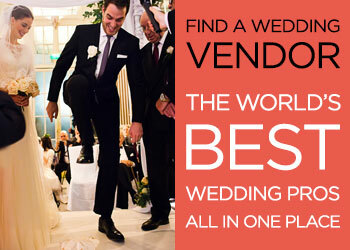 I trusted our amazing florist,La Dogaressa Flowers, to pick the right florals. 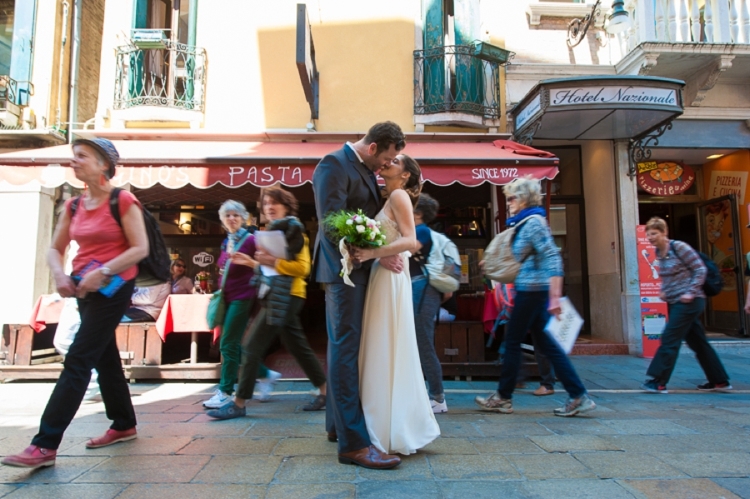 The perks of getting married in Italy, is that you can trust the various designers’ good taste. We love Mauro Pozzer! 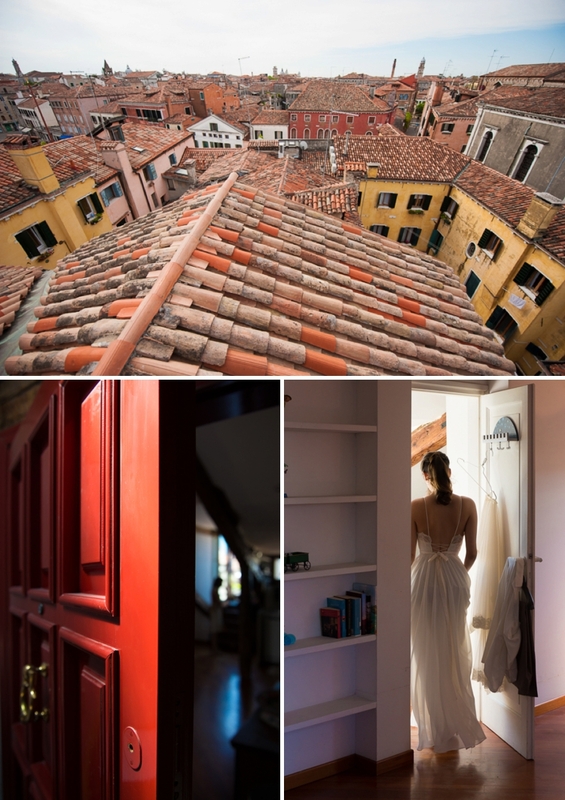 I am actually an avid photographer myself so I spent a lot of time surfing the web looking for the right photographer and when I saw Mauro’s compositions, colours and contrast in his photos, I knew he was the right guy, and different form the usual photographers. We actually didn’t think a cake was that important, but Amber suggested we have a cake and she also picked the cake for us and could not have chosen better (we don’t remember the Italian name of the cake but it was delicious!). Cutting the cake together added a very special moment to our wedding. During the party and celebration we had a FANTASTIC live band called Spazio Zero that played an “unplugged” version of some wonderful rock classics. 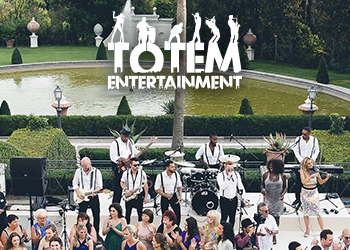 We had the live band that really rocked and we also surprised our guests with a short Gondola ride after the ceremony in the synagogue to the party venue. At Amber’s good suggestion we handed out masquerading masks to our guests with a little note from us on the back. 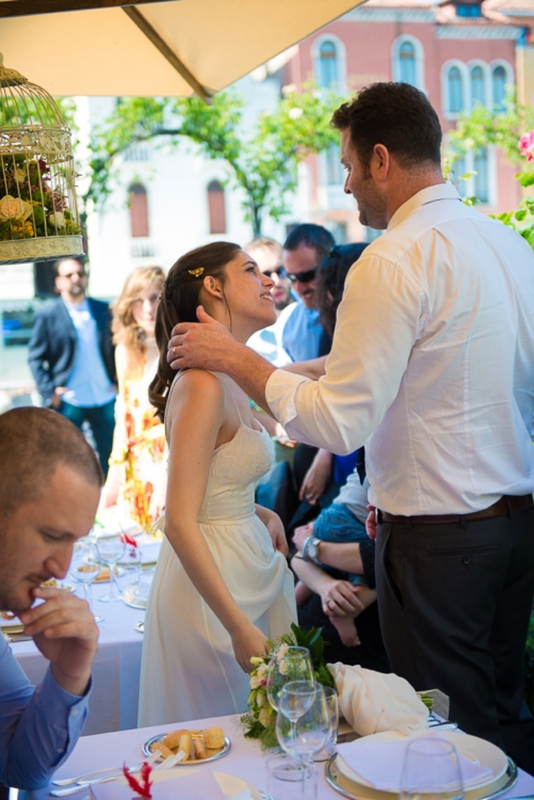 Our wedding happened to be on the weekend of the Final Four European League Basketball Championship, played in Milan, and our local team Maccabi Tel Aviv actually won the two dramatic games (!!). Therefore our guests were rewarded for making the journey, and in addition to celebrating our wedding, they enjoyed the games and were in very positive spirits! The final game took place two hours after the wedding, so together with our guests, we quickly changed our clothes and ran to the nearest sports bar to watch it altogether! Plan ahead and don’t leave things to the last minute! But really, my best tip is to take it easy and enjoy everything no matter how it all turns out. You’re simply celebrating your love with close family and friends who want to make you happy. Essentially there is nothing that can really “go wrong”. And another tip… check your lipstick every once in a while, so it wont look faded in the pictures!